Shop dbx 1215 Dual Channel 15 Band 2/3 Octave Graphic Equalizer from AMS with 0% Interest Payment Plans and Free Shipping. The DBX 1215 Dual 15 Band Graphic Equalizer was designed to meet the needs of the most demanding sound reinforcement environments, while offering the simplicity of straightforward controls. 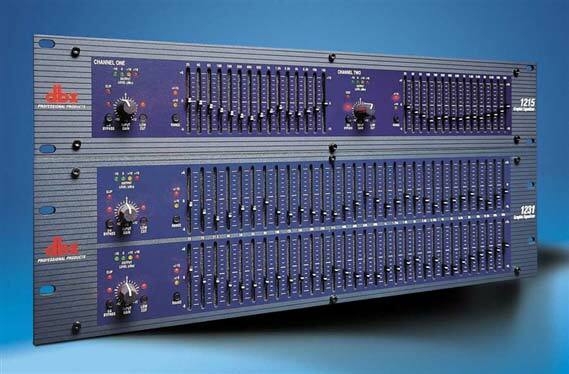 The DBX 1215 graphic EQ provides standard features like dual channels, 15 2/3 octave bands, ISO frequency centers, +/-12 dB input gain range, and switchable 40Hz/18 dB per octave low-cut filters. Other features on this dual 15 band equalizer include 45 mm faders, selectable +/-6dB or +/-15dB boost/cut range, XLR and 1/4 inch TRS connectors, balanced inputs and outputs, and chassis/signal ground lift capabilities for quick hum isolation.